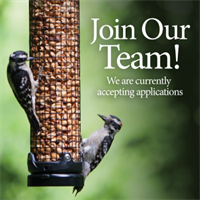 If you are a nature lover over 21, able to lift 20 lbs, have a flexible schedule and enjoy a fun work environment this may be the job for you. The ability to work both weekdays and weekend is required. Job Description: Sales Associate Overview The position of Sales Associate is a part-time position that reports to the franchise owner or manager. The primary responsibility of a Sales Associate is to provide a high energy customer experience. Selling / Customer Experience • Understands that the high energy customer experience is the #1 priority. • Able to deliver the WBU high energy customer experience as the trusted local expert. • Uses successful selling skills to satisfy the customer and complete the sale. • Wears logo apparel while working on the sales floor. Merchandising • Understands and communicates the store’s merchandise and target products to the customer. • Completes the changing of displays, signing and the restocking of merchandise as directed by management. Personnel Management • Demonstrates a positive, enthusiastic and professional demeanor. • Attends store meetings as required. • Completes any other duties as assigned. Administrative Control • Adheres to all store policies and procedures regarding the ringing of all transactions, any administrative duties and scheduling. • Completes accurate and legible paperwork. Loss Prevention • Adheres to all store policies and procedures regarding personal and store security. Store Maintenance • Maintains good housekeeping standards to help present a clean and well-presented store. • Helps keep store and backroom clean & organized. Request an application at wbumontgomery@gmail.com or stop by the store.